After a two-year hiatus, USACA (the national cricket board) has revived the national U-15 tournament, although the format is somewhat different from previous years. The Western Conference tournament will take place at the Woodley Cricket Field, in the Van Nuys district of Los Angeles, over Thanksgiving weekend ( 29 November– 1 December 2013). The team that wins this tournament will play the winner of the Eastern Conference tournament in June 2014. The Central East Region, of which Michigan forms a part, is fielding a team, under the direction of Mir Ali, C.E.R. Youth Coordinator and an official of the Bollingbrooke Premier League in Chicagoland. Mr Ali has asked MCA to find up to four U-15 players for the team, which will be coached by Hasan Khan of the BPL. Almost all of the cost of participation will have to be borne by players’ families. Assuming that air tickets will cost at least $600, players should anticipate expenses in the region of $1,000. A generous sponsor has covered the cost of the coach’s travel, but players’ families will have to pay for accommodation, transportation, and meals. Players should fly to LAX on Thursday, 28 November, returning to DTW late on Sunday, 1 December or even, perhaps, very early on Monday, 2 December. It is hoped that the Michigan contingent will fly out together, ideally with at least one adult accompanying them (unaccompanied minors flying across the country present problems for ticketing). Each team will play three forty-over matches; cricket whites are required. The leading teams in this tournament will be very well-prepared. North West Region (essentially, Northern California) has already announced what will certainly be a strong team, based around players from the top cricket academy in the USA, the California Cricket Academy. The C.E.R. team will be travelling “for experience”, although, of course, everyone will work hard to try to win matches. In the past, MCA has regularly contributed players to C.E.R. U-15 teams. For example, MCA players participated in the national U-15 tournaments in 2009 (Northern California), 2010 (New Jersey), and 2011 (Connecticut), with the C.E.R. team finishing third, third, and seventh, respectively in what was in those years a single, nation-wide tournament. Reports can be found in the archives on this web site. The leading members of those C.E.R. teams had quite extensive experience of age-level tournaments and some had played several years of league cricket – for example, MCA’s three representatives on the C.E.R. team two years ago had played in many youth tournaments over several years (California, Chicago, Toronto, etc) and all had played a significant number of matches for teams in Mich-CA league tournaments – ie, they had played quite a lot of adult club cricket, in addition to age-level tournaments. While this year’s Michigan players are likely to be far less experienced, they should expect an enjoyable tournament and, with the squad size anticipated to be quite small, ample playing opportunities. Players interested in participating in this tournament (preferably in the age range 14/15) and willing to countenance the expenses involved should contact Michael Makin immediately. C.E.R. hopes to announce the final squad on the 20th, possibly after a training session in Chicago. Photograph courtesy of Malika Frank. For the first time ever cricket has been included in the Amateur Athletics Union Junior Olympics, currently taking place in the Metro Detroit area, with 12,000 young athletes participating in some thirty sports. The Junior Olympics Cricket Tournament was held over the weekend of 27/28 July at three of the area’s best cricket grounds: Bloomer Park, Rochester Hills; Troy Community Center; and Lyon Oaks Park, Wixom. In the U-15 bracket Cricket League of New Jersey, coached by DreamCricket’s Earl Daley and managed by Malika Frank, overwhelmed an inexperienced Michigan Cricket Association team, managed by Swati Chitre and coached by Abhinhav Varma and Rajan, winning the first match of the three-match series by over 100 runs and the third match by nine wickets (the second was abandoned in the third over because of torrential rain). CLNJ’s team included players with extensive experience in youth cricket – leg spinner Vivek Narayan, who two years ago played for the USA U-15s at the age of twelve, the Ramrattan brothers Raymond (captain) and Richard, who have consistently starred at youth tournaments for several years, and Gauranshu Sharma, a veteran of overseas and Canadian tours with select teams. Guaranshu’s 41 not out, together with Man-of-the-Match Shekhar Kripalani’s 52 not out, provided the lion’s share of CLNJ’s monster total of 170/2 in the first match, at Lyon Oaks, after Mich-CA captain Smit Chitre had won the toss and invited the visitors to bat. It was no surprise that the home team struggled in their reply, although Aditya Das, with 26, put up an excellent fight. In the third match, on Sunday morning at Bloomer, Mich-CA batted first and struggled on a drying pitch and heavy outfield, posting a modest total of 48 (“extras” leading the way), which CNLJ bettered within nine overs for the loss of just one wicket. Man-of-the-Match was Advait Manur. A friendly match at TCC followed. Despite seeing their well-prepared team dominate the hosts, Daley and Frank were generous in their praise of the tournament and looked forward to further visits to Michigan. 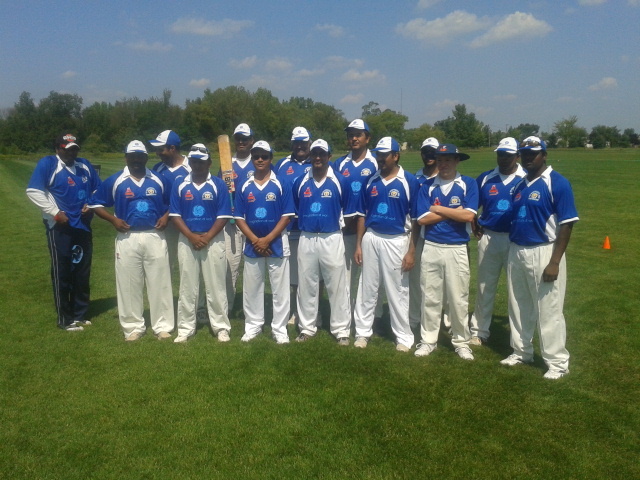 The U-19 bracket saw four teams compete in an initial round-robin – Phoenix XI, representing Bloomfield’s International Academy, coached by Mohamed Ali, North-east Region/Southern Connecticut, coached by Jay Singh and managed by Mohan Radakrishan, Midwest Cricket Conference Colts, coached by Akhil Sridher and managed by Krishna Meluveetil, and Michigan Cricket Association U-19s, managed by Mich-CA Secretary and MCA Information Director Michael Makin (the author of this report). The novice cricketers of International Academy (their side strengthened by two guest players from MWCC) struggled in all three matches. In the first they concedied 200 runs to Mich-CA to lose by over 140 runs. Mich-CA’s Iftekhar Hussain scored 67 not out in short order, Aniruddha Mayasandra 48, Gordon Makin 42; Man-of-the-Match Mayasandra’s bouncing, fast-turning left-arm spin accounted for four IA batsmen and Burhan Khan’s speed was always too much for the beginners. IA lost their second match by almost 150 runs to MWCC, who posted 170/6 and dismissed IA for 21, before they bowed out to NER on Sunday. NER, fielding a relatively inexperienced side, with opening batsman Karanjit Singh of Connecticut probably the senior man, posted a modest total of 57 against MWCC in their first match of the tournament, at Bloomer Park, with accurate medium pacer Rahul Kosgi (three wickets), leg-spinner Nauman Khan (two), and man-of-the match J. J. Goenka leading the Chicagoland bowlers. However, the men from the East Coast would have been encouraged by a bowling performance that put the Chicago team under a little pressure, taking five wickets before MWCC overtook the NER total, and would, no doubt, have also comforted themselves with the knowledge that they had lost to the most experienced side in the tournament, match-hardened by their recent participation in MWCC’s midweek tournament, played under lights, during which the Colts team recorded a fine victory against a senior side. The Mich-CA vs NER match on Saturday afternoon at Bloomer Park looked set to determine who would play MWCC in the final, as news came through of the travails of the International Academy team against the Chicagoans, but, sadly, rain intervened again. Mich-CA had posted a solid, but not overwhelming total of 115, with top contributions of 42 from Mayasandra and another powerful knock from Iftekhar (37), but had, in the opinion of some observers, played a dangerously high number of “dot balls”; in the sixth over NER were 22/2 before torrential rain made the field completely unplayable. The abandonment meant that, if Mich-CA beat MWCC on Sunday morning at TCC, or lost narrowly, they would play the Chicagoans in the final, while NER had to overwhelm IA and hope. In fact, a narrow win for Mich-CA was to eliminate NER. On a Sunday morning the two Midwestern teams, full of players who had played with and against one another for five or more years, lined up in friendly, but intense competition at TCC. The MWCC captain, Arjun Ahuja, won the toss and elected to bat, but Mich-CA’s bowling resources, strengthened on Sunday by Zamil Rahman, playing in place of Khan, who had work commitments, alongside steady medium-pacer Ahsanul Hoque, all-rounders Foyaz-Ahmed Lingkon and Hamza Ansari, and spinner Mayasandra, made things difficult for the Chicagoans. The hosts were generous in the field, dropping opener Paarth Joshi four times (with several of the chances embarrassingly easy), but no MWCC player was able to take full advantage of the errors, and Mich-CA looked at a target of 107 on the smallest ground in the tournament with some confidence. The hosts replaced Makin with Lingkon at the top of the order, and the powerful Hamtramck man gave Mich-CA a strong start, despite fellow-opener Mayasandra’s early dismissal, but when he fell for 26 and man-of-the-match Iftekhar was caught and bowled by Goenka for 38, the Michigan men wobbled. Makin, batting at four, steadied the ship, playing sensibly, scoring mostly ones and twos with ground shots, until his second four brought the hosts to within two of victory, whereupon an injudicious attempted pull saw him fall lbw to the nagging line and length of Arnav Sridher. When Sridher’s next ball removed the incoming batsman, also lbw, there were some nerves in the Michigan tent, but Zamil took a single off the first ball of the next over and a Chicago wide settled the match. Rain intervened again at Bloomer Park in the afternoon, but, despite delays and anxieties, the final, reduced to eighteen overs, was completed. The hosts won the toss and chose to bat, with Lingkon and Makin opening. When, after a cautious start, Lingkon began to dispatch the visiting bowlers with some enthusiasm, only to be caught on the boundary for 14 by Man-of-the-Match Tarang Patel, running from long-on to long-off to take an excellent catch, the pattern of the Mich-CA innings was set – fine plays in the field dismissing aggressive batsmen when well set. Paarth Joshi was particularly distinguished, taking three excellent catches, making sure that none of Mich-CA’s leading batsmen got the runs their starts suggested were possible. Iftikhar and Zamil both posted quick double-digit scores, and opener Makin began to open his shoulders, pulling a ball that pitched on middle stump over the long midwicket boundary for six, but they all fell to fine fielding, with Makin’s dismissal for 23 (top score in the match) perhaps crucial in keeping Mich-CA’s score down — his attempt to lift Sridher’s first ball, a half-volley, over deep mid-on foiled by a brilliant one-handed grab, arm fully-extended, from Joshi, who was also to contribute 17 with the bat. Nonetheless, Mich-CA felt that, on a wet wicket and a heavy outfield, 95 in 18 overs could be defended. More rain came after the fifth over of MWCC’s reply, with the visitors on 21/2, sending everyone to their DL calculators. After some twenty minutes, play was resumed, with the Michigan skies constantly changing and DL par scores being communicated to both teams after each over. At first MWCC, then Mich-CA, went ahead on DL par, but, as the skies cleared, it looked as if the hosts, who had taken wickets regularly, despite the problems of bowling and keeping in difficult conditions, had the advantage. Mayasandra’s spin had been very effective in the later overs, while MWCC had not cashed in on further fielding errors from the hosts. With two overs left and all of MWCC’s recognized batsman gone, Mich-CA seemed confident of victory: 18 required off 12 balls. Lingkon bowled a good over, conceding just five runs, and removing Patel for 20. Thirteen off six balls seemed a huge target for MWCC’s tail, with Monit Khandwala and Rahul Kosgi in. On the boundary, some supporters of the local side thought that the captain would bring himself on for the final over, but, instead, he turned to pace. The last over began in the worst possible way for Mich-CA, as a chest high no ball brushed the batsman on its way to fine leg – three runs, and still six balls left. Suddenly, the visitors had hope again, and their players and supporters beyond the boundary raised their voices in support of their ninth-wicket pair. Wides, some struggles in the wet outfield, and aggressive running between the wickets brought the target down to four off two balls – still a big “ask”, although it might have been bigger if Mich-CA had brought the field in against the less aggressive of the two batsmen. With the tension as palpable as the humidity, Monit Khandwala stepped up to drive a good length ball wide of long-off and across the boundary, winning the match with MWCC’s first four of the innings. Ecstatic MWCC players, coaches, and supporters rushed on to the field to embrace their brave batsmen; a deflated Mich-CA team walked off with their heads down, although they were quick to congratulate their friends and rivals from Illinois. Tarang Patel’s excellent catch and his 20, top score for MWCC, saw him win the man-of-the-match award, although, at the awards ceremony, the Chicago team was quick to invite Khandwala, late-middle-order batsman Salman Khan (11), and Kosgi up to the podium to share the trophy. The closing ceremony saw the AAU’s Casey Todt and Mich-CA’s Shahid Ahmed speak warmly of the collaboration that had led to the award of Junior Olympics medals to all participants, and the inclusion of cricket in an AAU event for the first time in the organization’s 120-year history. Tournament Director Avinash Komireddy and Grounds Management Head Yoginder Seagan were congratulated for their tireless efforts, while visiting umpire Deepak Katte of New Jersey was thanked for his outstanding work. Coaches, managers, and parents were also thanked for their work, and hopes were expressed for further successful youth tournaments – surely vital for the development of the game in the United States. The local players went home disappointed to be runners-up in both brackets, but they U-15s could feel that they had made a very solid start to their careers as competitive cricketers, and the enthusiasm of their parents bodes well for the future, while the U-19s, who had never assembled as a playing XI before Saturday morning, had good reason to be very proud of their efforts throughout the tournament. As Bloomer Park emptied under yet more drizzle, several players also remarked on what a pleasure it was to see so many old friends from across the country and to make new ones – a reminder that cricket, for all the intensity of competition, remains perhaps the most social of all team sports. Iftekhar celebrates his man-of-the-match trophy and his 169 runs in the tournament, photograph courtesy of Iftekhar Hussain. Next weekend (29-30 September), an Atlanta U-17 side, managed by Vijay Ganji, travels to Chicago to face a side representing the Midwest Cricket Conference. MCA is already planning to contribute a player to the Atlanta side, but Coach Ganji is looking for one more player to complete his XI. If you are interested in playing, please contact MCA’s Information Director immediately. In its continuing quest to help young players in this region improve and refine their cricketing skills, Midwest Cricket Conference is proud to present the inaugural inter-city Youth Tournament for primarily Under 17 (and some Under 19) cricketers. One of the best-known Cricket Academies in the country – Cricket Academy USA of Atlanta, Georgia, led by our very own Anand Tummala (coach of the Shekhs/Tushar Youth Coaching Camps) – will be touring Chicago over the weekend of the 29th and 30th of September, 2012. They have very kindly agreed to play Midwest Youth in 2 40-over games, one on each day.